Cook asparagus in simmering water in large skillet 2-3 minutes or until bright green, but still crisp; drain. 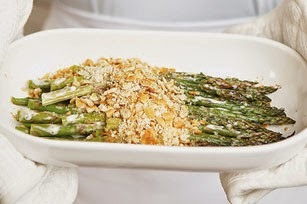 Toss asparagus with dressing in 1 1/2 to 2 quart baking dish. Sprinkle with cheese and cracker crumbs. Bake 10-15 minutes or until cheese is lightly browned and mixture is heated through.